Summer of 70 at Tassajara, the time of the Sandokai Lectures - discussed by some disciples. DC note: I was asking people questions for something I had to write on the summer of 1970 at Tassajara at the time of Suzuki’s Sandokai lectures, maybe as a possible piece to use for the book of his lectures on the SDK. It starts off with some comments by Reb Anderson and moves to notes taken at a disciples’ meeting with Reb, Mel Weitsman, Peter and Jane Snyder, Paul Disco, and Ed Brown. RA: That summer Suzuki Roshi brought down the statue of prince Shotoku, the regent of Buddhism in Japan who imported Buddhism in 522 brought over a lot of Korean statues and Buddhist texts he's the patron saint of Buddhism in Japan. We thought the statue was Zendai Doji, but it wasn't. It was a statue which Suzuki Roshi had in his cabin and people would take to their house on a four and nine day and have tea and people would come visit. 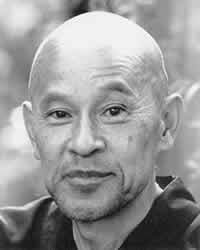 On the San Do Kai lectures: that was the last time Suzuki Roshi was healthy at Tassajara. It was a rich and wonderful time. A lot happened. He ordained little kids that summer maybe the Johansens maybe they came for the summer. He was giving everyone a lot of attention. It was the first summer after Tatsugami Roshi came, Tassajara had become more form oriented. He created the doan-ryo (zendo and ceremony staff), service became elaborated. There was the San-pachi ceremony on three and eight days. We were chanting the Sandokai and Suzuki Roshi’s Sandokai lectures flowed out of that. Suzuki Roshi felt he could get a bit more classical in his teaching. Suzuki Roshi was interested in what had been instituted, he wanted to familiarize himself with that he pretty much went along with it. DC note: Reb and I were both on the doan-ryo which entailed studying chanting with Tatsugami. Reb was the most diligent in this. Reb says he had been copying Tatsugami's chanting style and that Suzuki taught him more, retrained him to chant more simply, added subtlety. DC note: That summer Stan white was Reb’s boss in the office and put Reb in charge of scheduling so Reb scheduled Stan and when he told Stan his time had come, Stan said no it's not, you're not in charge of scheduling any more. Talking to several people at once here: Suzuki Roshi asked Mel what he'd like to do and Mel said be ino (head of zendo, ceremony, doan-ryo) and Suzuki Roshi said I’d rather have you be my jisha (asst.) so Meg became ino. Mel remembers Meg in a bathing suit - she was ino in a bathing suit which he thought was weird. Reb says Marian Derby was ino too at some point that summer as well. Reb was head doan under Marian.. Maybe she was ino for a time or acting ino at times Jane Schneider says Bob was ino. No he was ino during the winter-spring practice period. Peter says Jane was ino. No, that was later. Reb was ready to go to Japan in the spring of ’71. He'd been studying Japanese with a tutor and then Suzuki called it off or didn't let it happen, maybe because he knew he was dying. Reb and Suzuki Roshi agreed he would be ordained and Mel caught Reb trying on his koromo to see what size he should wear. Chogyam Trungpa Rimpoche came that summer. He stayed in the fireplace room. People liked him. There was a good feeling. He came with his young English wife Dianne, Sam and Hazel Bercholz. Jack Weller had arranged the visit. [Some one said Trungpa came in the summer of ’69 but Reb worked then in the city. Trungpa and Suzuki walked down to the pool. Trungpa went into the zendo with shoes on and we liked him. Suzuki Roshi was apprehensive about the visit beforehand as were various others but it went quite well. Ed Brown says he was in the office then. Stan and Reb (who were in the office) say no he wasn’t. Paul Disco says Ed did the stone work on the foundation after Paul had set up the forms for Suzuki Roshi's new cabin, which became the Kaisando, and Reb agreed but Mel says no Ed did that later, maybe in the fall.